Serial port to Ethernet + I/O pins in one box. Control remote DI/DO & RS-232/485 over Telnet. Remote serial RS-232/485 port with 2 relays for 230V AC, DIN rail mountable housing. Simply control serial port and two relays through Telnet. Monitors the functionality of a device over IP (PING/WEB) or serial line (RS-232), automatically restarts it upon failure. Web watchdog monitors two independent channels. Full RS-232 serial port to Ethernet with logging. Simply Terminal server with flash backup for Rx serial data. Converts a RS-232 or RS-485 line to Ethernet, using TCP/IP and UDP/IP. Full remote serial port can be mapped as COM7 in Windows using the HW VSP (Virtual Serial Port) utility. /O Controller 2 can be connected with a PC over the LAN in order to use the I/O Controller 2's serial port as a Virtual Serial Port (VSP). HW group offers a free HW VSP application that supports up to 100 remote serial ports (support includes Windows 7 and x64 systems). 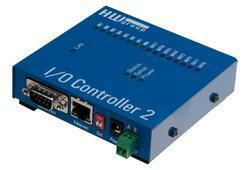 I/O Controller 2 offers a truly full RS-232 serial port (9 signals). Two devices can be connected peer-to-peer (Box-2-Box mode). In this mode, the digital I/O as well as the RS232/485 serial line are extended (tunneled) over the LAN. 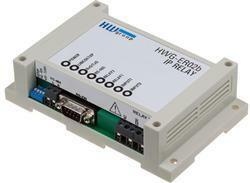 Ethernet relay, DIN rail, Web interface. Features 2x DI (dry contact input), full RS-232/485 serial port, and 2x DO (relay output, 230V/16A). Controlled over the web or Modbus/TCP. Two IP relays connected back-to-back can extend (“tunnel”) the serial port and I/O over a LAN. 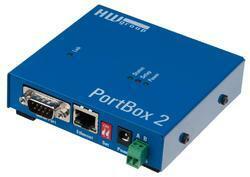 PortBox2 is a RS-232 and RS485 full serial port to Ethernet converter. The remote serial port can be accessed in Windows as a Virtual Serial Port. Web-based configuration, full RS-232 (9 wires), 9th bit support (virtual parity). 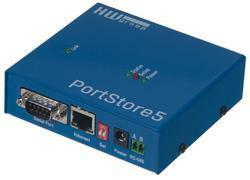 PortStore5 connects a full RS-232 or RS-485 serial port to a LAN. Features a 4 MB internal flash memory for RS-232 data capture. Stored data can be retrieved when the LAN connection is re-established. Remote serial port can be accessed in Windows as a Virtual Serial Port. WEB-based configuration and full RS-232 serial port (9 pins).